Thurles County Tipperary Where Exactly Is It ? 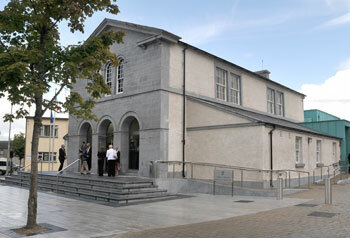 Thurles Courthouse where Fine Gael will be taking some of us shortly. A threatening Minister Phil Hogan is about to take you to court, lock you all in jail, gain access to your bank accounts and made withdrawals. If you do not have a bank account he will deduct his ill advised household charge from your pay, pensions and social welfare payments and ‘pigs will fly,’ Minister. Before you rush out in a subservient sweat, trembling fearfully in anticipation of a kicking from Minister Phil Hogan Nazi jackboots, let us have a look at just a few aspects of who is going to receive this expected funding, and how they will spend it. An annual Household Charge of €100 has been introduced in order to fund local services. The Local Government (Household Charge) Act 2011 (pdf) provides for this charge, which is an interim measure and will be replaced in future by a valuation-based property tax. The new charge is separate from, and in addition to, the Non-Principal Private Residence (NPPR) charge. So if you own a residential property in Ireland, you are obliged to declare your liability for the Household Charge and pay it by the due date, without question. Now let us look at two of the hopeful beneficiaries of this tax in North Tipperary, e.g. Thurles Town Council and North Tipperary Council Co. and ask can Thurles, in particular, be categorised as a “Ghost Estate,” as is the case of people living in certain unfinished housing estates, who can claim a waiver for the years 2012 and 2013, assuming of course we pay our €100 to fix these unfinished projects. Define an unfinished housing estate Minister? Is it an area where the street lighting does not work properly, as is the case in Kickham Street, where over the past 9 months the public street lighting flashes on and off at 3 minute intervals, or like Cathedral Street, where the public lighting burns both day and night? Is it an area where wheelchairs cannot travel on footpaths in fear of overturning, and where elderly pedestrians must walk beside moving vehicles on busy roadways to avoid breaking an ankle? I won’t discuss potholes and roads that are reminiscent of gravel driveways and for which I currently pay €3 per day in annual car road tax. Is it an area where signposts are so broken and abused that they no longer serve any purpose? This week, per the Tipperary Star Newspaper, Thurles Town Council paid out €8,000 in grant aid to various organisations, all of whom are indeed worthy. Well to be more correct the taxpayers of this town paid out €8,000 in grant aid to various organisations which our Town Councillors deemed to be worthy recipients. However a written request for funding in respect of attracting tourism to our town, sent in July 2011, still awaits a reply. Do you now still think Minister Hogan should receive his Household Charge? Enough about Thurles Town Council for the moment, despite their generosity last week, they are after all, according to their own report, unable to collect the bones of €700,000 in rates, such is the drop in daily business and the rise in empty shop premises, within the town. Let us look at just one aspect of North Tipperary Co Council’s spending, so take a look at its new websites. “We need to continue to support those with an entrepreneurial flair in setting up their own businesses. The Government and County Council must do all in their power to promote responsible local ownership of business by people who have a stake in the health of their local community and local economy. The recent establishment of the Enterprise Support Unit by the County Manager and the new enterprise centre at Tipperary Institute are most welcome. These developments in tandem with the imminent launch of the Tipperary.com website will provide invaluable assistance to start up companies and established companies that are looking to expand. It is my hope that the Minister at the Department of Environment, Community and Local Government will attend the launch of the website and provide a platform for both the County Manager and I to impress upon him the huge economic potential of our county. Not my words folks, but the words of Mayor Michéal Lowry nine months ago on June 28th 2011. So what is the problem? Examine it for yourselves my friends; just follow the link to what formally, for years, carried links selling Chinese pornographic plays. “So what is wrong with the site, sure it looks grand,” I hear you all say. My friends, “All that glitters is not gold,” so here are just some of the errors. Pictures are not optimised for portable network graphics, and vary in size between 600kb and 80kb, so God help any person, worldwide, on low bandwidth, they won’t wait, and will instead be taking their entrepreneurial flair to Poland. To view the true position of this site (as at today 2oth March 2012, 11.15pm,) go to the largest tourist attraction in Thurles, click here for St. Mary’s Famine museum. Yes, your PC is working, no error my fellow Thurles business people depending on tourists, you found nothing, it does not exist. Go to Link ‘Towns And Villages,’ any sign of Thurles.Info or Hidden Tipperary. Answer “No Sir.” Thurles Information offends Councillors and elected overpaid Politicians and must not be in anyway encouraged. Go click here on Anner Hotel, Yes, picture displayed is the rear of the derelict Munster Hotel half a mile away. It was worse yesterday, Lar Na Pairce, The Story Of The Gaelic Games in Thurles The European Town of Sport, had a picture displayed, showing that this tourist facility was being used as a Stock Room for the GAA shop. It has been removed today. Go to Hayes Hotel, link to this page and try out its advertised weblink, surprise, surprise it is incorrect, sending you nowhere and should read www.hayeshotel.ie. I won’t go into the numerous obvious spelling mistakes and grammatical errors throughout this site, but Google Bots will not be visiting here too often in its present state. Now you can see, partially, why Counciller John Hogan was silenced for daring to be publically critical, regarding what his fellow Councillors knew nothing about. Our technical team, here, offered free assistance to both the North Tipp County Manager and to our Mayor, prior to the setting up of this expensive hard coded site, but then what would we know. Sure Tipperary businesses and the unemployed (who own their own houses) won’t know the difference anyway. Enough for today, its late, but we will be looking further at North Tipperary Co Council and in particular at Fine Gael Ministers tomorrow, the money they waste and why Thurles students will have no work this Summer, courtesy of Minister Phil Hogan, Noel Coonan TD and Minister Leo Varadkar. Do check in tomorrow for a further episode, preferably before you pay your household charge. For myself, Minister Hogan, I won’t be paying, so book me into Cell Block B, as I do not fancy the slopping out, and that area has had its water upgraded to 21st century “Flush Status,” for all prisoners, for the first time since Queen Victoria waved goodbye. 2 comments to Thurles County Tipperary Where Exactly Is It ? I believe that Thurles deserves the award as there are fantastic facilities here, but another missed opportunity regarding tourism advertising.